Yes, the much-awaited, herb-encrusted rack of lamb recipe I posted details about on Twitter & Facebook is coming soon, I promise. :) It's just a very time-consuming recipe to write. No worries; that doesn't mean it'll be a long post, but just that a lot of thought has gone into the preparation of this dish. As you may've noticed, I tend to cook various cusine types in "waves." One week, I'm really into making Asian food and the next I'm craving something completely different. Earlier this week, I made matzo ball soup, and now I'm in the mood to offer more selections from Jewish cuisine. 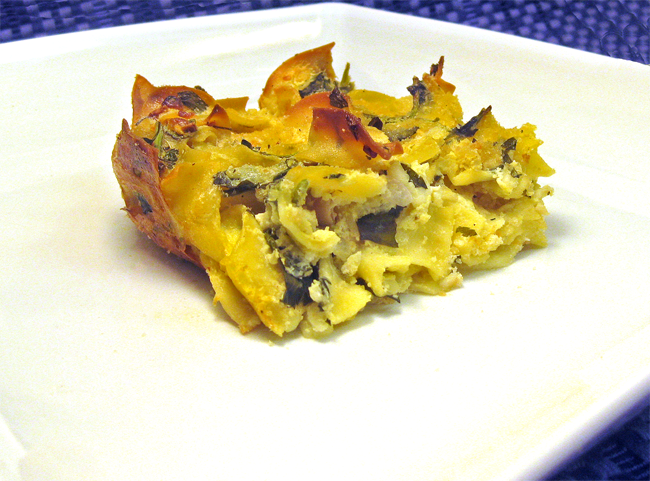 This time, I'd like to present a recipe for a lesser-known dish, noodle kugel. This is another food that Ashkenazi Jews brought over with them when they immigrated to America. There are basically two versions of this dish, savory & sweet. Of course, the savory version is the one we'll be making today. OK, enough about that. 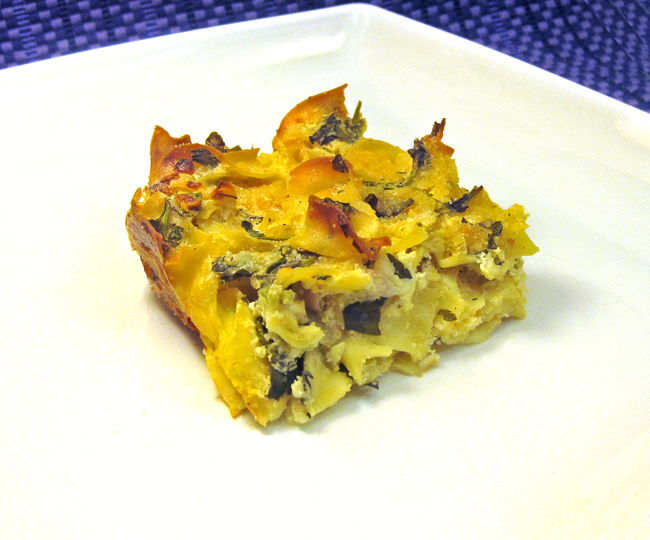 I'd much rather talk about the savory version of kugel. :) So, if you like noodles & cheese together, then this dish is for you. :) And, who the heck doesn't love the combination of noodles & cheese?! Directions: Preheat the oven to 375°F. Using a wide pastry brush, coat a 9" x 13" glass baking dish with olive oil. In a large pot of boiling salted water, cook the noodles until tender, according to package instructions. [Most wide egg noodles (i.e., Manneschewitz brand) take no more than 7-9 minutes, maximum, to cook.] Drain & rinse them with cold water. Set aside. In an electric mixer, whip the cottage cheese & yoghurt. Then add eggs, shallots, salt, black pepper, red chili pepper flakes (if using), one ingredient at a time, & continue whipping the ingredients until smooth, thick, & creamy. Turn off mixer. Fold in the parsley, oregano, basil, marjoram, & noodles & spread mixture evenly in the baking dish. Sprinkle bread crumbs on top, evenly distributing them across the kugel, followed by tiny (1/4") cubes of butter. Bake for 40-45 minutes or until kugel sets & turns a light golden brown. Open oven, slide out tray, & test kugel by cutting into it with a knife. Kugel should be somewhat solid & give some resistance when you cut through it. If kugel is too soft or there's still too much moisture, then bake for an additional 15-20 minutes, or until kugel has solidified a bit more & the bread crumbs have turned a light golden brown. Let it sit for 10 minutes to cool. Cut into 3" squares, top each portion with about 1 Tbsp. lowfat sour cream, & serve. Chef's Notes: *If this is your first time making kugel, and you'd prefer to try the traditional version instead as your first experience, just following the same basic instructions above but omit the following ingredients: shallots, red chili pepper flakes, parsley, oregano, basil, & marjoram.